Dear Leader Kim Jong-Il is so obsessed with cinema that he might have, in another life, been a movie director. But if you are the heir apparent to a ruthless dictatorship like North Korea you can instead create a “theater state,” scripting every move of the largest crew in the world - your own people. Kim orders the kidnapping of a famous South Korean actress and her director husband in order to make North Korean film making more professional. The couple witness appalling violence, poverty, and constant propaganda while at the same time, indeed, creating a credible North Korean film industry. The true story of this couple’s years in North Korea, making films and planning their daring escape at the same time, is as captivating as any movie thriller. Readers of The Orphan Master’s Son will find this an enlightening read providing context to that novel. "The 1978 abductions of the South Korean actress Choi-Eun-hee and her ex-husband, the director Shin Sang-ok, in Hong Kong is the true crime at the center of Paul Fischer's gripping and surprisingly timely new book." 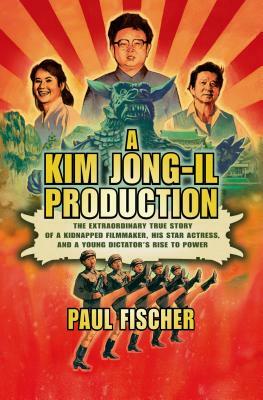 A nonfiction thriller packed with tension, passion, and politics, author Paul Fischer's A Kim Jong-Il Production offers a rare glimpse into a secretive world, illuminating a fascinating chapter of North Korea's history that helps explain how it became the hermetically sealed, intensely stage-managed country it remains today. PAUL FISCHER is a film producer who studied social sciences at the Institut d’Etudes Politiques in Paris and film at the University of Southern California and the New York Film Academy. Paul’s first feature film, the documentary Radioman, won the Grand Jury Prize at the Doc NYC festival and was released to critical and commercial acclaim. A Kim Jong-Il Production is his first book.